National Geographic once wrote of Corcovado that it is “the most biologically intense place on Earth." This unique site was once an island that years ago drifted to the mainland. 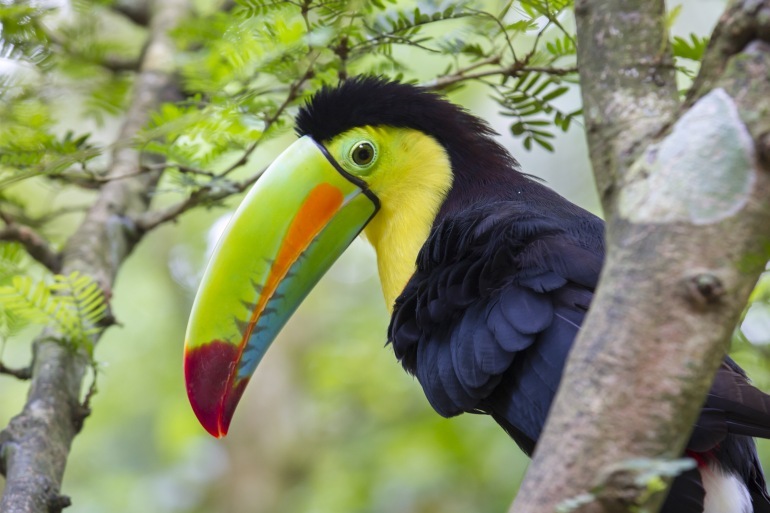 It is one of the last best places for Jaguars, Tapirs and White-lipped Peccaries in Central America, as well as a home for hundreds an incredible array of other animals, plants, butterflies, amphibians, and birds. The Ultimate Hiking Adventure includes the very best of Costa Rica in terms of hiking and wildlife opportunities. It features challenging hiking in the cloud forests of Cerro de La Muerte and the lowland rainforest of the exceptional Corcovado National Park, where you'll pass through three of the four Ranger Stations of the park. You'll travel to remote areas that afford truly intimate contact with nature, visiting places few others venture to. You can start this trip any day of the year with a minimum of 2 travelers. We'll spend 2 nights at the remote Sirena Ranger Station. The accommodations here are very basic yet the location allows for the top wildlife experience in the country. Having an open, adventurous spirit is the key to enjoying these 2 nights, due to the simplicity of the lodging and the potential for rough weather conditions. This trip requires excellent physical shape. Arrive in San Jose anytime today. Meet and greet and transfer to your hotel tonight, the Aurola Holiday Inn. After crossing the City of San Jose you will continue your journey to the famous Lodge Paraiso del Quetzal, located in Cerro-La Amistad protected zone. Here you will take a hike to look for the Resplendent Quetzal in this lush and renowned cloud forest. Later you can relax, exploring the gardens and the hummingbird feeders (which can offer astoundingly close encounters with these amazing birds) while resting and preparing for your hike early the next morning. Cerro de la Muerte birding highlights include Resplendent Quetzal, Emerald Toucanet, Band-tailed Pigeon, Sulfur-winged Parakeet, Black Guan, Collared Trogon, Hairy Woodpecker Acorn Woodpecker, Silvery Throated Jay, Gray-breasted Wood-Wren, Mountain Elaenia, Dark Pewee, Black-capped Flycatcher, Scale-crested Pygmy-Tyrant, Buffy Tuftedcheek, Ruddy Treerunner, Spot-crowned Woodcreeper, Mountain Robin, Black-billed Nightingale-Thrush, Mountain Robin, Long-tailed Silky-Flycatcher, Black-and-yellow Silky-Flycatcher, Black-throated Green Warbler, Collared Redstart, Black-cheeked Warbler, Wrenthrush, Timberline Wren, Flame-colored Tanager, Spangled-cheeked Tanager, Sooty-capped Bush-Tanager, Rufous-collared Sparrow, Yellow-thighed Finch, Slaty Flowerpiercer, and Golden-browed Chlorophonia. Among the hummingbirds here are Green Violet Ear, Volcano Hummingbird, Fiery-throated Hummingbird, Magnificent Hummingbird. Among the animals that may be seen in their natural habitat here are Coyote, Kinkajou, Spider monkeys, Coati, Mountain Rabbits. After breakfast, you will be driven about 10km to the starting point of the trek in the town of Providencia. Challenging hiking, trekking up and down lush forested hills and across creeks. You'll hike La Chaqueta en route to Albergue del Río. You will descend to about 2000 ft (700m) elevation and travel about 10 miles (16 km). Here you will take a rest and have a typical local lunch with Mr. Edwin and his family. After lunch you will continue on to Albergue del Rio traveling 3.6 miles (6 km) more. At this elevation, you are entering lowland forests and may encounter wildlife such as monkeys and toucans. You will spend the night at the rustic Albergue del Rio Lodge (shared bathrooms, no electricity). Today hike about 6 miles (with 5 miles being up and down hills) to the pristine Rio Savegre and Division rivers. You will now have completed your mountain forest and valley hikes and entered into lowlands containing a mixture of rainforests, beef cattle pastures, African oil palm and teak tree plantations. After the hike take a 4 x 4 taxi to Cooperative Silencio and then van transfer to Puerto Jimenez. Overnight at Finca Kobo. Finca Kobo is situated on 50 hectares, including 30 hectares of private primary rain forest and 20 in reforestation. This hybrid tourism/agricultural project is a model for local sustainable development, combining an organic farming operation that includes a wide range of tropical fruits as well as raw chocolate from their cacao acreage. Birds common to Providencia-El Brujo include Great Tinamou, Great Curassow, King Vulture, White Hawk, Roadside Hawk, Laughing Falcon, Costa Rican Swift, Band-tailed Barbthroat, Green-breasted Mango, Violaceous Trogon, Black-throated Trogon, Rufous-tailed Jacamar, Fiery-billed Aracari, Chesnut-mandibled Toucan, Golden-naped Woodpecker, Wedge-billed Woodcreeper, Northern-barred Woodcreeper, Dot-winged Antwren, Chesnut-backed Antbird, Black-hooded Antshrike, Scale-crested Pygmy Tyrant, Rufous Piha, Turquoise Cotinga, Red-capped Manakin, Tropical Gnatcatcher, Buff-rumped Warbler, Cherrie´s Tanager, Golden-hooded Tanager, Bay-headed Tanager, Blue Dacnis, Green Honeycreeper, Shinnig Honeycreeper, Orange-billed Sparrow, Thick-billed Euphonia, Yellow-crowned Euphonia. Wildlife that can be encountered in the Providencia-El Brujo zone include White-nosed Coati, Agouti, Howler, White-faced Capuchin, Two-toed sloth, Collared Peccary, Red Brocket Deer, Tamandua Anteater. Early in the morning, drive in a 4x4 to the entrance of the Corcovado National Park at Los Patos Ranger Station (short drive, about 45 minutes). The trail begins at Los Patos and goes for about 20 kms all the way to Sirena Ranger Station. At the beginning of the hike, one can see an old secondary forest. At approximately two hours of up and downs, the topography flattens when the trails enter the Corcovado basin. Here the forest changes into an old growth or primary forest. There are several rivers to cross along this trail. The park is famous for the abundance of wildlife. Hikers usually see tracks of wild animals like peccaries, tapirs and even puma or jaguar. Overnight at the Sirena Station. The Sirena Rangers Station Shelter offers basic facilities, such as shared rooms, shared bathrooms with no hot water and a common dining area for meals. Corcovado National Park is the crown jewel of Costa Rica’s vast network of protected areas. The Sirena Station is the best example of the park’s famous biodiversity. Described as “the most biologically intense place on earth” by National Geographic this coastal wilderness park is home to shy and elusive jaguars, tapirs, all four of Costa Rica’s monkey species, white-lipped peccaries, stunning scarlet macaws, several species of parrots, toucans and hundreds of other bird and wildlife species. Enjoy the day exploring the many trails in this isolated and pristine rainforest station. Birds that could be found here include King Vulture, Great Curassow, Scarlet Macaw, Baird´s Trogon, Violaceous Trogon, Black-throated Trogon, Golden-naped Woodpecker, White Hawk, Roadside Hawk, Orange-collared Manakin, Chesnut-backed Antbird, Bicolored Antbird, Streak-chested Antpitta, Black-hooded Antshrike, Dot-winged Antwren, White-whiskered Puffbird, Wedge-billed Woodcreeper, Fiery-billed Aracari, Chesnut-mandibled Toucan, Rufous Piha, Chesnut-mandibled Toucan, Yellow-billed Cotinga, Turquoise Cotinga, Riverside Wren, Golden-crowned Spadebill, and Cherrie´s Tanager. Animals that may be seen in their natural habitat are all 4 species of Costa Rican monkeys: Spider, Squirrel, White-faced Capuchins and Howlers monkeys, Sloths, Anteaters, Tapirs, Peccaries, Agouties, Coatis. From January to April and July to October Humpback whales maybe be seen right from shore on occasion. Among reptiles and amphibians, you may see Granular Poison Dart Frog, Green and Black Poison Dart Frog, Basilisk Lizard, Central American Whip-tailed Lizard, Boa Constrictor, Black Iguana and Green Iguana. Early morning start the hike to the southern end of the Corcovado National Park (17 km total, about 6 hours of hiking) to La Leona Station. The trail system goes mainly parallel to the beach all the way to La Leona. This is an especially beautiful rainforest area offering excellent wildlife viewing. Overnight at La Leona Lodge, a unique and isolated 'luxury' tented camp on the Pacific ocean. Walk along the beach for 30 minutes to Karate beach, in order to take an approximately one hour transfer on a local truck to Puerto Jimenez. From Puerto Jimenez, take a scenic domestic flight to San Jose. Upon arrival in San Jose, transfer to your hotel in San Jose for your final overnight. Today, transfer to the airport in time for your flight home.